Disarmament Insight: CCW: Out of step and almost out of time? Almost two months after the culmination of the Oslo Process in a ground-breaking new international Convention on Cluster Munitions (CCM) in Dublin, what does the traditional forum for regulating conventional weapon systems, the UN Convention on Certain Conventional Weapons (CCW), have to show? Is it indeed making progress toward an agreement by the end of 2008 that will also have a positive impact in reducing the risk of harm to civilians from cluster munitions? Or was the CCW's third (and longest) session of its Group of Experts this year instead a case, as someone in the Conference room put it, of "the treadmill is turning, but the hamster is dead"? Those readers who've followed this blog's commentary on work in both the CCW and the Oslo Process on cluster munitions may recall that the CCW achieved a mandate in November 2007 to "negotiate a proposal to address urgently the humanitarian impact of cluster munitions, while striking a balance between military and humanitarian considerations." It could be observed that the CCW was galvanized into action by the emergence of the Oslo Process and the way it snowballed. Some major users and producers of cluster munitions shunned the Oslo Process. China, India, Israel, Pakistan, Russia and the United States (all CCW members) said the CCW was the appropriate place to negotiate on cluster munitions. Nobody would disagree, but it's indisputable that the Oslo Process emerged because of the CCW's failure to act. Yet in November 2007, as it by coincidence, the CCW achieved a mandate to work, although clearly less ambitious than the February 2007 Oslo Declaration, which called on states to "prohibit cluster munitions that cause unacceptable harm to civilians." Most countries in the Oslo Process echoed the UN Secretary-General's statement that the two processes on cluster munitions were "complementary" and "mutually-reinforcing". Many delegations worked in both, and some (especially the Europeans) argued that the CCW could deliver added value to any treaty agreed in Dublin by achieving CCW standards that would capture the big users and producers not in the Oslo Process, even if these benchmarks were lower. And, while the political stewardship of the CCW has been (in part because of its consensus practice) markedly imperfect, the CCW is an important international legal norm, and its protocols do have value and deserve universal support and adherence. But now that the Dublin celebrations have subsided, there is a CCW a hang-over to deal with. Unlike most hang-overs, it's possible that with time this one will become worse and not better. The basic problem for the CCW is that its members don't all agree on meaningful new international legal measures on cluster munitions. Russia has been the most vocal about its reluctance (it's more interested in 'best practice' of existing international humanitarian law (IHL) rules) but Russia isn't alone. No-one working in the CCW environment is under any illusion that anything can be achieved that's as ambitious as the CCM, but it's hoped that something is possible despite foot-dragging to date. Moreover, now 60 per cent or so of the CCW's membership have a new challenge: to ensure that whatever is developed in the CCW doesn't undermine what was agreed in Dublin. And such a scenario is distinctly possible. In June, the Chair of the CCW this year, Ambassador Bent Wigotski of Denmark, circulated a working paper for "the sole purpose of providing a basis for further negotiations", adding that "It is based on proposals by the Friends of the Chair, as well as contributions put forward by delegations". Although containing gaps, Wigotski's paper was structured as a draft protocol. The paper followed difficult discussions earlier this year in which concerns were raised, for instance, about selective use of IHL rules (and therefore scope for creative reinterpretation) in drafting proposals by one of Wigotski's Friends of the Chair. Although talks have continued this July, these concerns haven't subsided. In addition, unease among some turned to consternation part-way through the three-week July CCW expert meeting when the Chair issued a "draft common approach paper" of possible elements to be included in a text as the basis for negotiations on several articles (2,3,4,5 and 6) of his earlier paper. This paper seemed to many to pander to a US Department of Defence policy on cluster munitions and unintended harm to civilians dated 19 June, widely regarded as very minimal, and which was castigated by the Cluster Munition Coalition. Whatever the case, it was not great for trust in my view. The emergence of the paper appeared to polarise those in the conference chamber. And there are signs that CCM-supporting states (including not only the Oslo core group countries but Australia, Canada, France, Germany, the UK and other Europeans) are preparing to dig in, if necessary, against aspects of the Chair's papers despite the slightly strained and artificial outward bonhomie of this CCW meeting. It will be interesting in coming months to see what they make of his new edition of a text circulated at the very end of the expert meeting on its final day last Friday. Historically in the CCW, the progressives have rolled-over in the face of disappointing agreements - perhaps figuring that some agreement is better than none at all, as in the case of Amended Protocol II in 1995-96. The situation is different now. There is already a robust standard, one agreed in Dublin and with high-level political support from CCW heavyweights among the NATO Europeans, among others. All bets are off that CCM supporters will allow themselves to be rolled for a lower standard in a CCW agreement that conflicts with or undermines the CCM. If the Chair's approach, which focuses primarily on rules on use of cluster munitions, won't ultimately fly, is there any realistic alternative? One option would be to go for a transfer ban, either in a legally-binding protocol or as a political declaration of CCW members. While not achieving any prohibitions or specific restrictions on cluster munition use, such an approach would at least acknowledge the reality that demand for cluster munitions internationally is going to diminish as the CCM takes hold. It could be a brief agreement - drafted in a paragraph - not an inconsiderable factor when the CCW experts have only a week in September of work time left and a few days in November to wrap things up. It wouldn't require any changes to military doctrine - always a complicating factor in negotiations for internal decision-making among the military powers. Most importantly, it would have a discernible humanitarian impact, ensuring that, as we've seen with other weapon systems, the oldest and least reliable stocks of cluster munitions disposed of from major military states don't end up proliferating (or being dumped on as 'military aid') to others and then being used. Crucially, however, any such alternative path would have to be on the understanding that would only the first stage in further CCW work to ensure that, in coming years, other meaningful measures on cluster munitions are negotiated. So the hamster's not dead, but that's no reason for complacency. Both the CCM and the CCW are too important. 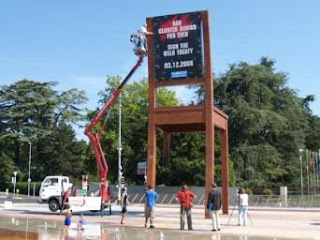 Picture by author of the Philippe Schiller's landmine chair sculpture and Handicap International Suisse banner outside the Palais des Nations courtesy of Handicap International Suisse.